Rad is a Property Management System for Irish B&B’s and small hotels. It is a Desktop Web Application being developed by a Limerick start-up company. To get started, I compared different Property Management Systems (PMS) currently on the market. I considered competitive advantages, target market, pricing models, strengths and weaknesses, compatibility, aesthetics, brand voice, usability, layout and navigation. and deciding how to leverage strenghts and weaknesses. User Research was conducted mainly through Interviews and Contextual Enquiries. This information, together with Market Research, showed some interesting insights about our prospective user base. Behaviour, attitudes and goals became more clear after interviews, as did pain points with existing products. In terms of usability, the most important finding was that approximately four out of every five B&B operators are aged over 50 years, with half of that number aged 60 or over. Designing with accessibility in mind for this group will improve design for all. At this point, requirements, features and functionalities were revised and re-defined. A sitemap was used to visualize content relations and design how users navigate through logical paths. Use cases and task flows for our target users supported the information architecture of the app, described in the sitemap. Sketches and wireframes ensured the best possible flow for the interactions. I worked on (tons of) paper and moved onto low-fi Sketch wireframes. High fidelity wireframes turned into first iterations, used to create clickable prototypes with InVision. 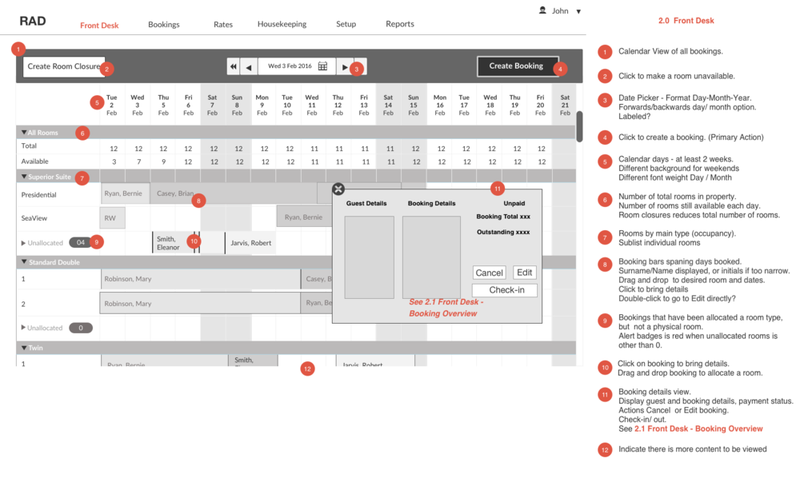 Rad’s screens fall mainly into three patterns - calendar view, table views and forms. The interface was based on Bootstrap’s 12 column grid - this was a developer’s preference. Interface elements are based on Bootstrap components. Visually, I aimed for an interface that was clear, simple, harmonious and well structured.